Welcome to City Fare, located in the heart of downtown Los Angeles. 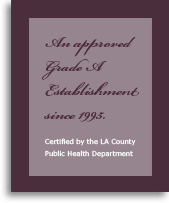 Since 1995, we have had the pleasure of serving many local businesses, private and public entities, and the entire metropolitan community. We offer full-service catering with an extensive menu and impeccable staff to handle your special occasion. From business meetings and corporate functions to private and celebrity events, we have the expertise and reputation to fit your needs. For more information or to discuss your particular event, please contact us by phone or email at 213.746.2224 or office@cityfarecatering.com. ©2018, City Fare, Inc. All Rights Reserved.